The journal places special emphasis on what its Editors-in-Chief Drs Michal Parzuchowski and Marcin Bukowski call "the updated FOCI" – an abbreviation for Focused on people, Open, Committed and Integrative. The changes meant to lead up to the journal's long-term progress, also outlined in the latest Editorial, come as a result of SPB joining two prime movers in the open science field – the Leibniz Institute for Psychology Information (ZPID) with its unique publication platform, PsychOpen GOLD, and Pensoft with its innovative journal publishing and management system, ARPHA. In the new pilot project, ZPID's PsychOpen GOLD also collaborates with the technologically advanced academic journal and book publishing platform ARPHA in order to further facilitate and increase visibility of the novel findings of societal value. "We proudly present the new SPB journal to the scientific community, representing a major breakthrough in open access publishing in psychology," says ZPID director Prof. Dr. Michael Bosnjak. "SPB on PsychOpen GOLD assisted by ARPHA is now up and running at record speed." "It's really exciting to announce our partnership with ZPID, PsychOpen GOLD and SPB, in this collaborative venture to advance accessibility and visibility of research with such an impact on our own society," says Prof. Lyubomir Penev, founder and CEO of ARPHA Platform and its developer – Pensoft Publishers. "At ARPHA and Pensoft, we have always worked towards next-age innovations in Open Science – be it improved accessibility, findability, usability or collaboration – so it only makes sense to join in this amazing initiative to open up the latest fine research in psychology." The journal's first thematic issue comprises 10 forum papers (by Dariusz Doli?ski, Arie Kruglanski, Adam Factor & Katarzyna Jasko; Leonel Garcia-Marques & Mario Ferreira; Wolfgang Stroebe; Karl Halvor Teigen; Jolanda Jetten & Alexander S. Haslam; Miros?aw Kofta; Bogdan Wojciszke & Konrad Bocian; and Klaus Fiedler) dedicated to discussions on behavior and its measurement as triggered by Prof. Dariusz Dolinski's article "Is Psychology Still a Science of Behaviour?". He argues that in addition to studying phenomena like stereotypes, attitudes, and values – which he dubs the "what, how, and why people think", social psychology needs to also remain dedicated to the "what, why and how people act", i.e. things such as aggression, altruism, and social influence. Follow the discussion in the second 2018 issue of Social Psychological Bulletin on the journal's new website. Social Psychological Bulletin (formerly Psychologia Spo?eczna) is an open-access quarterly journal that publishes original empirical research, theoretical review papers, scientific debates, and methodological contributions in the field of basic and applied social psychology. SPB actively promotes standards of Open Science, supports an integrative approach to all aspects of social psychological science and is committed to discussing timely social issues of high importance. 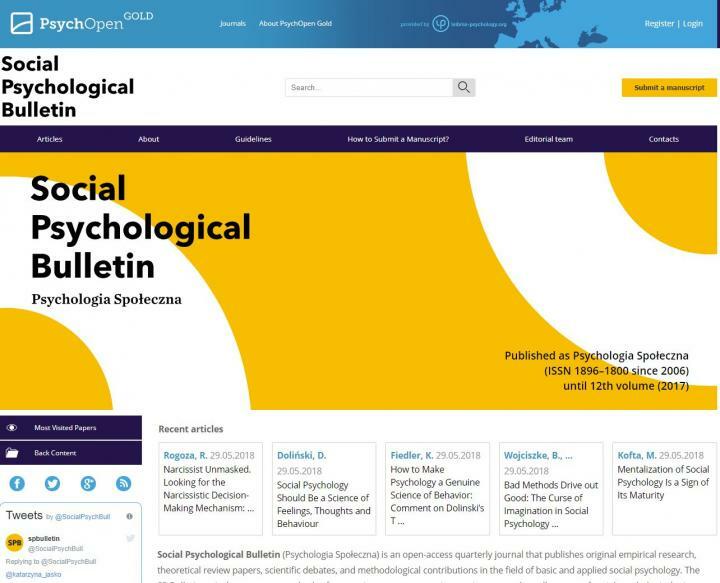 Offered by Leibniz Institute for Psychology Information (ZPID), PsychOpen GOLD is an online platform for publishing primary scientific contributions in psychology. All publications in PsychOpen GOLD are accessible free of charge (open access). Journals published on PsychOpen GOLD must meet clearly defined quality standards such as peer review of the submitted articles, an international editorial board, and English-language metadata. PsychOpen GOLD journals are represented in international scientific databases including Scopus, PubMed Central, PsycINFO, PubPsych, and DOAJ. It is committed to the idea of open science and sees itself as a public open science institute for psychology.